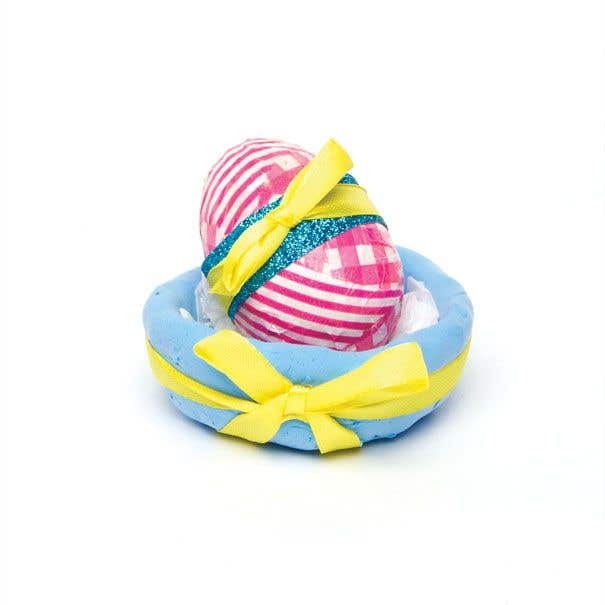 This eggstra lovely Easter decoration is perfect for the home or classroom, and can be adapted as part of an Easter egg hunt too! Roll out a large ball of blue air dry clay. Mould into a bowl by using the 'thumb-pot method' - pushing your thumbs into the centre of the ball to create a hole, then pinching the edges until they are the desired thickness, and smoothing out the clay. you'll want the bowl to be quite wide with a large base for the egg to sit in, as shown. 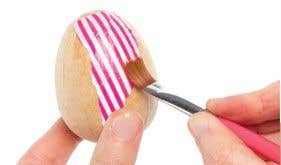 Take an egg and apply decoupage paper - ripping the paper into pieces, applying decoupage glue to the egg, pressing the paper into the glue then brushing glue over the top and repeating until all the paper overlaps and the egg is completely covered. Leave to dry. Cut a strip of self-adhesive glitter paper that it long enough to fit around the centre of the egg horizontally and carefully apply, press down on the card as you go to ensure it sticks firmly in place. Add a length of yellow ribbon on top and tie in a bow at the front, as shown. Scrunch up white tissue paper and arrange inside the clay bowl. Pop the egg on top. To finish, tie a length of yellow ribbon around the bowl, securing in a bow at the front. Try replacing the egg with a decorated two-part egg (L1047) and hiding a treat inside as part of an Easter egg hunt.